Today’s post is a bit of a smorgasbord – a few rather unrelated items but all (to my mind :)) worth mentioning. First, for any of you who read last week’s post The Wonderful World of Kid Lit, here is a very articulate, thoughtful rebuttal of the Wall Street Journal article mentioned therein which you might find interesting: Deeper Understanding: The Dark Is Rising, from Shelf Awareness, Enlightenment for the Book Trade. Let me know what you think of Jennifer Brown’s article! Second, I had a great visit at Merritt Bookstore in Millbrook, NY to celebrate Not Yet, Rose winning the Mom’s Choice Award. Two large groups from three local preschools came to hear the story (about 100 children all together!) They were a terrific audience. Unbeknownst to me, one of the adults in the back was videoing with her phone. Quel horreur!!! Although watching and listening to myself give a presentation was quite horrifying and made me want to go hide in the closet with a burlap sack over my head, I have been told I should edit the video and put it on my website so that interested teachers/schools can see a sample of a presentation. What do you think? Should I do it? I can't stand to hear/see myself. It is always weird, and I always think, “Do I really sound like?” However, I think it's usually an accurate representation, and no one else seems to notice. Thanks for the vote of confidence E.J. I shall bear it in mind whilst I pit my fledgling technological skills (and I use that term loosely!) against imovie….! I wouldn't want to edit it myself, but you should have someone edit it and post it. I'll think you'll be happy you did. Good idea, Cynthia. Although actually, there's not that much to work with… and it might cost more than it's worth to get someone to edit this one. I know it sounds freaky, but everyone will tell you to do it. It's a GREAT moment for you. So… take a deep breath and just enjoy the rush. YAY!!! Can't wait to see it, actually. And congrats on the nomination. Whooo hooo! Congratulations on the award nomination and win. And yes, if the quality is decent, go ahead and put the video up. I'm like you, I hate seeing and hearing myself on film. I always sound and look like I'm on Valium. Horrible!! I enjoyed your perspective on the WSJ article. Even though I read it before, since I posted on the same topic, I wanted to look at it again. And huge congrats for the nomination, Can't Sleep without Sheep is my favourite! How wonderful, Susanna! Congrats! And I most definitely think you should post that vid. How cool! 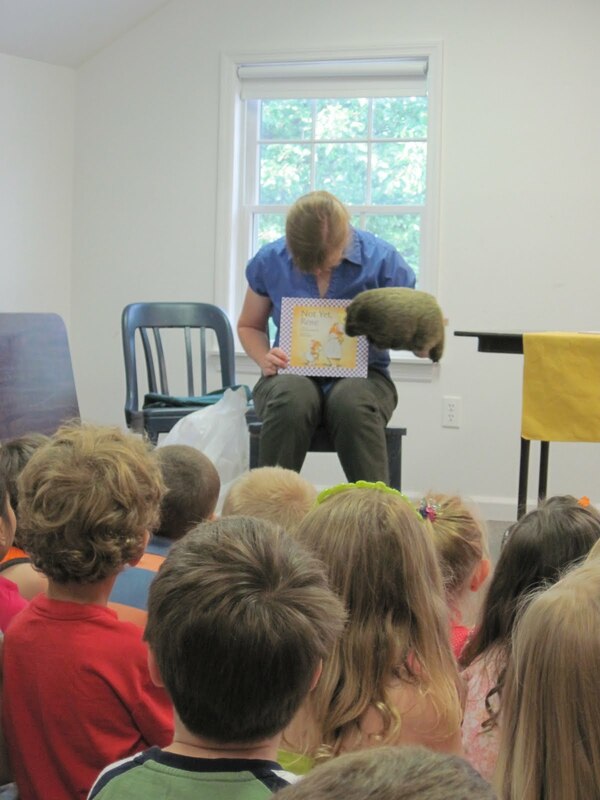 I think quite possibly the most exhilerating feeling in the world is reading a story to small children. It just thrills me to the bone! Pk – school visits are really fun! Sometimes the kids say the darndest things, and it's always fun to share stories! Wonderful! How great your books are getting the recognition they deserve! Congratulations on being nominated! With so many books out there, that is pretty cool! You should definitely use the video on your website – what a great idea! And congrats on the award nomination! It couldn't have happened to a sweeter person. Good luck (or merde as they say in French)! Congrats on the nomination! I'm pretty sure my children and I have checked out at least one of your books from the library. They're going to think I'm so cool when I tell them I posted a comment on your blog. : ) It's always nice to feel like a cool mom, if only for a second. Yay…Congrats! I'm kind of nervous when posting things on my blog only because I'm not sure about the rights issue. I would recommend checking that out. But the turn out was awesome! Good luck with that nomination too! What a lovely surprise in your e-mail box! I never find anything very useful in Google Alerts, so it must have been cool. Thanks for sharing the link to Jennifer Brown's article. It is a nice rebuttal. Congrads on the nomination! That's soooo sweet! Thanks for sharing the link. Use the video on your site. Fantastic idea. You rock!